Few, if any, musicals mine darker creative ore than Assassins. By humanizing a group of disenfranchised, semi-stable malcontents, Stephen Sondheim and John Weidman tell a story of the American Nightmare, a haze of anger, frustration, and humiliation that can, apparently, only be relieved by killing the President of the United States. It’s long been in the short list of my favorite shows of all time (it shows up twice in my “greatest moments of Sondheim” list). It’s also bear of a show to pull off, requiring a very deft directorial hand to keep the audience in that uncomfortable state where they’re genuinely empathizing with despicable characters. Furthermore, it’s an ensemble show that requires vocal virtuosity throughout. The piece is rangy and demanding. But Ray of Light continues to be a small company that insists on thinking big. With last year’s excellent Jerry Springer: The Opera the company showed their ability to rise to the challenge of a large cast singing tough music. 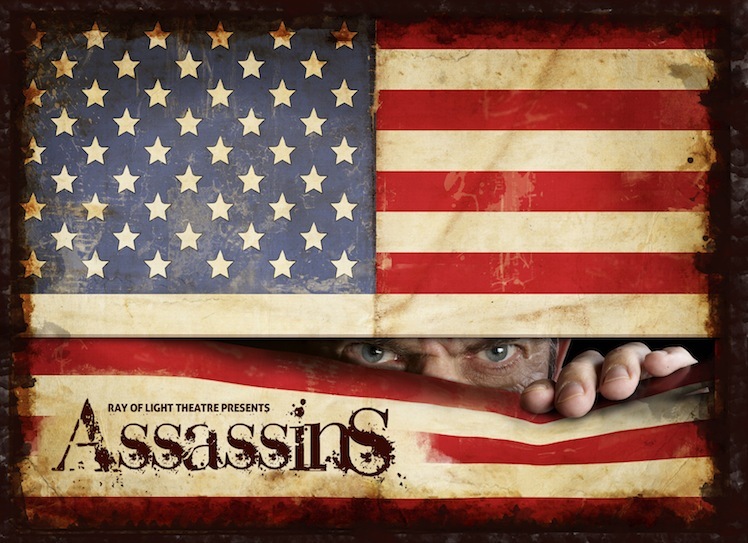 If any non-professional company would be able to put on a convincing production of Assassins, it would be Ray of Light. And for the most part, they do a great job. The production is sharp, very well acted, generally well sung, and, surprisingly, very funny. In a strange reversal of what you’d expect, the musical numbers are considerably darker than the spoken scenes, particularly the well timed comedic exchanges between the Sara Jane Moore (Lisa-Marie Newton) and glassy eyed Manson protoge Squeaky Fromme (Eliza Leoni). They are the clowns that provide relief from the more grave broodings of Booth, Czolgosz, and Zangara, all of whom have more grounded reasons for their actions and are therefore harder to dismiss with a laugh. The production is not without some wrinkles. Not all the voices are spot on, there is some occasional pitch uncertainty in extreme registers, but most disturbingly, intelligibility suffers in some key moments. It’s a combination of both the amplification in the house and the vocal production of the performers, but many of Sondheim’s lyrics are lost, particularly in Zangara’s number (which, to be fair, is a challenge for any vocalist). Audience members less familiar with the score than myself seemed likely to miss large chunks of what was going on in several musical numbers. That said, the musicianship in general was quite high. Particularly appreciated was the good sized orchestra that David Moschler assembled for the performance. This was no drum and keyboard with synthesized winds setup, but real honest to goodness instruments! That alone is worth the price of admission. Standouts in the cast include Derrick Silva, whose Booth was confident and suave, with just a hint of dandy containing a self righteous temper. Joel Roster created a touching self deprecating Czolgosz as he professed his love to an equally touching and empathetic Emma Goldman (Anna Smith). Danny Cozart was a hilariously unhinged Sam Byck, whose rantings would move freely between laughable and terrifying. But the real coup in this production (and a big healthy SPOILER ALERT here for folks who would like to be surprised, even if you HAVE seen the show before.) is a small casting change that make so much sense, that adds so much to the arc of the show, that I can’t believe the original creators didn’t see it from the very start. In this production, the Balladeer (Michael Scott Wells), the proxy for the audience and for mainstream American thought, the ever optimistic cheerleader for the American Dream, gets transformed by the motley crew into the biggest assassin of them all, Lee Harvey Oswald. Suddenly the Balladeer, who is normally little more than a theatrical device, becomes a crucial character and an arc is created that adds a world of depth to an already deeply thoughtful show. With strong direction, fantastic source material, and high production values, I can forgive the missed lyrics and minor vocal imperfections. Assassins is a perfect mix of real theater and real music, with no compromise. It’s intelligent, thoughtful, and insightful, words I rarely associate with musical theater. There may well be no other show like it, and this is a rare opportunity to see a strong production. Assassins is playing through June 25th at the Eureka Theater in San Francisco. Tickets are available through Eventbrite.